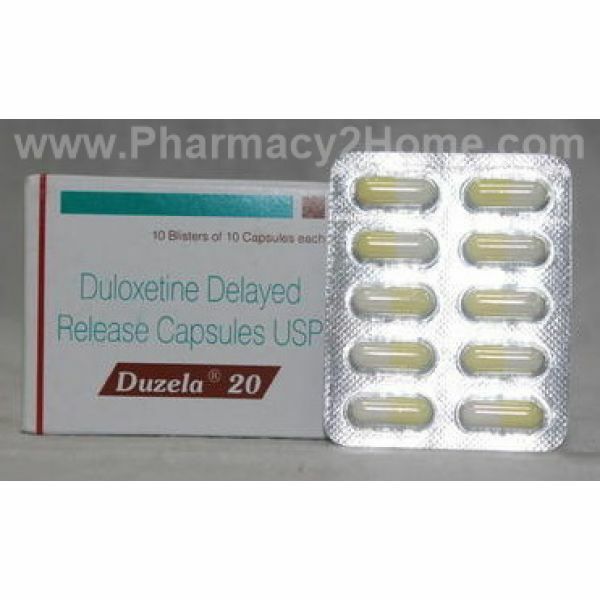 Duloxetine is a selective serotonin and norepinephrine reuptake inhibitor (SNRI) that is used mostly in treatment of major depression disorder and generalized anxiety disorder. It is also effective in treatment of osteoarthritis and muscle and bone pain. It relieves pain in peripheral neuropathy (especially in diabetic neuropathy) and can be used to control the symptoms of fibromyalgia. As mentioned in the section above, Duloxetine is a selective serotonin and norepinephrine reuptake inhibitor. It works by affecting certain neurotransmitters in the brain. Most experts agree that depression and other psychological and mental disorders are caused by disturbances between neurotransmitters, mainly serotonin and norepinephrine. 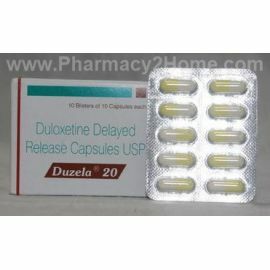 Duloxetine reduces the reuptake of those neurotransmitters by nerves after their release, which results in their increased levels. Generic Duloxetine should be kept in a cool, dry and dark place, away from the reach of children, and used before its expiration date. Generic Duloxetine is taken by mouth, with some water, with our without food. If it causes nausea or upset stomach, it may help to take it with meals. Capsules should be swallowed whole, not chewed or opened. The recommended dosage of Generic Duloxetine in treatment of depression is 20 mg or 30 mg twice a day or 60 mg once a day. For other issues, such as anxiety disorder, fibromyalgia and diabetic neuropathy, the usual dosage is 60 mg per day. In some cases doctors recommend starting with 30 mg and then increasing the dosage to 60 mg per day, which helps the patient adapt to the drug. Never take more than the recommended daily dosage of Generic Duloxetine. Symptoms of an overdose, which can be very dangerous, include headache, vomiting, fainting and coma. In case you miss a dose of Generic Duloxetine, take the drug when you can but not if the time for the next dose is near. Caution is recommended in patients with a medical history of psychiatric disorders, suicide attempts, bleeding problems, glaucoma, kidney and liver problems, seizures and alcoholism. Avoid alcohol consumption. If the drug makes you dizzy, do not drive or operate heavy machinery. Control your blood sugar levels on regular basis. This drug may interact adversely with other drugs, especially antiplatelet drugs, blood thinners, NSAIDs, cimetidine, quinolone antibiotics, antipsychotics, antiarrhythmics, tricyclic antidepressants, MAO inhibitors, as well as with recreational drugs. Some of the possible side effects of Generic Duloxetine include nausea, vomiting, headache, dry mouth, constipation, loss of appetite, drowsiness, fatigue and increased sweating. Notify your doctor if you start experiencing unusual bleeding or bruising, low libido, impotence, muscle cramps, abdominal pain, dark urine, yellowing of the skin and eyes and seizure. Seek immediate medical attention in case of seizures, hallucinations, rapid heartbeat, loss of coordination, severe vomiting and twitching. Generic Duloxetine is a very efficient way to treat major depression disorder, as well as anxiety disorder and pain associated with conditions like fibromyalgia and diabetic neuropathy. In Europe, this drug is also used in treatment of urinary incontinence. As with any other antidepressant, it is not recommended to use this drug without consulting a doctor. Generic Duloxetine should not be used in case of allergic reactions to any of the drug's components. This drug is not considered safe from pregnant women and for children. Do not stop taking Generic Duloxetine on your own. Stopping using this drug without your doctor's explicit instructions can actually cause worsening of the condition and may exacerbate the side effects.